A Resource Rate an be set should one or indeed a team of your resources have their own indicative rate. For example, there are many levels of resources within a project such as ‘Developer’ and subsequently ‘Senior Developer’ all of which will contain various salary scales. By setting a Resource Rate allows you to keep track of their rates with accordance to your scheduling and budget spend. To apply an external or internal resource rate, simply click on the first tab ‘Search for Rate’. A drop down list will appear with the rates that are existing in your Billing Rate Card . 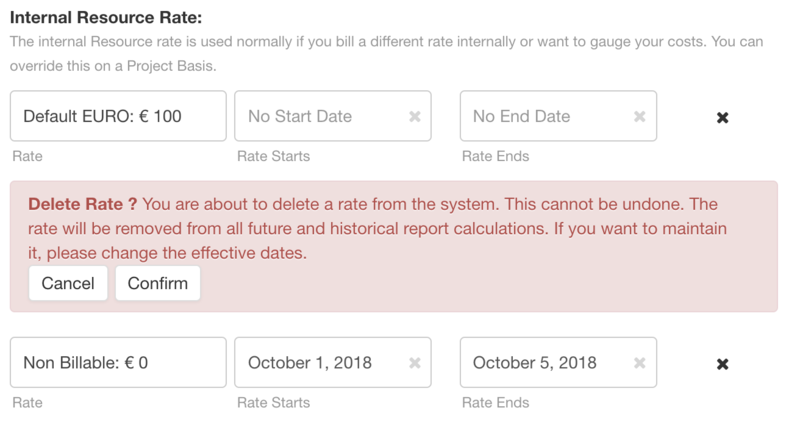 You can select a rate from here or scroll on down to ‘Add New Internal Rate’ to create a customized rate. The rate selected will be the external and internal billing rates respectively that will appear in your Billing Panel. 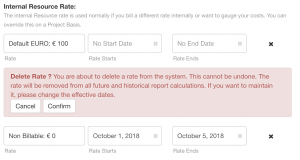 Defaulted to no start and no end date you have the option to select a date range for the resource rate to apply. Alternatively you can also set a start date and leave an end date open and visa versa. For example a specific booking or project. The Resource rate can be overridden at project level. Click ‘Update’ and the bottom of the page to apply. Resource Rates will act as a default rate for all projects unless a Project/Booking Rate is applied. Should you utilize applying rates for budgetary requirements, it would be imperative for you to apply an ‘Internal Rate’ to ensure coincide with the ‘External Rate’. Lastly, you must confirm by clicking on the green ‘Update’ button or alternatively click Cancel to delete any changes. And again, not forgetting you can delete an applied resource rate at this point should you need to. Alternatively you can manage your rates via the Billing Rate Card in Settings. You can add new resource rates on projects if they change. 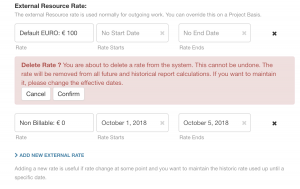 This allows you to change the rate of a resource during a project without losing the historical information on the legacy rate. 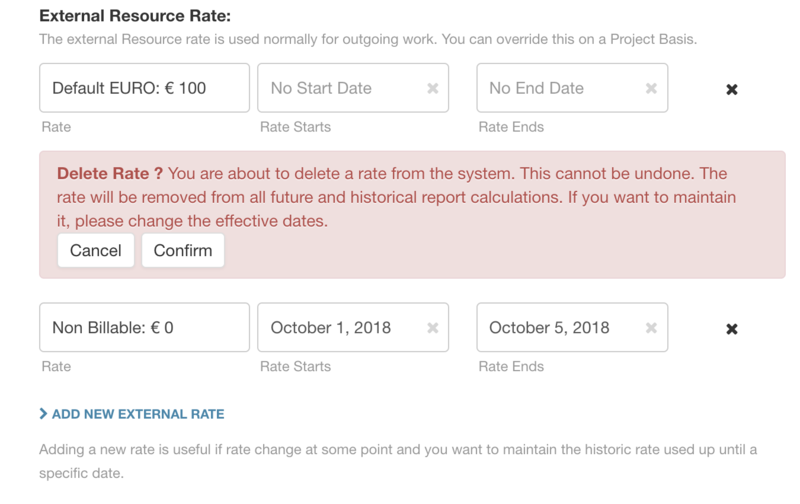 This can be useful if you change what you are billing a customer in the middle of a project, or if a resource or freelancer now change their rate, you can accommodate the change seamlessly. These rates can be applied externally, internally or indeed both. Therefore, for example should you need to amend the rate solely on the internal side without exposure on the external side then that can be solved immediately. You can instruct as many rates as required, however just to note that no rates can overlap by date range. You can also remove resource rates should you require to do so at this point. All rates created will be stored permanently within your Billing Rate Card for future use. It’s good to note here that these will be the overriding rates giving priority over any other rates applied or defaulted to the project or resource. This rate will act as the External and Internal billing rate that will appear in your Billing Panel view. At this point you also have the ability to create a new rate for a particular resource or indeed a number of resources that are working on this project. To apply, simply click ‘Add a New Custom External Rate’ / ‘Add a New Custom Internal Rate’. Two tabs will appear for you to select your resource from the drop down list followed by your desired rate. You can add multiple resources and multiple rates, and just to note this rate will override any project rates set out above. Also, not forgetting you can always manage these rates accordingly from this page or by editing the individual resource. Underneath Project Range you will see ‘Filters’ which has an extensive drop down listing of features that you can filter your report by. From Resources, projects, tags, budget and custom fields – there is an abundance to select from. Project Range Displays your report date range which you can alter by clicking once where the pop up date range interface appears. 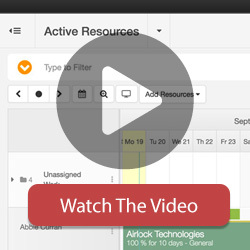 Simply pick and choose a desired date and your report will automatically update. Days / Hours Moving to the top right hand side of the panel the report is defaulted to Days. With the click of a mouse you can change to hours. Print The Print icon allows you to print the report or perhaps save as a PDF file etc. Invoice This clever panel also allows you to generate an invoice based on the information you have selected. Save Naturally, there is an option to save your report. A pop out allows you to create a name for the specific report and also apply visible access rights to the report. Export An extensive range of exporting options available to you from Excel to CSV but also down to the finite details of specific headers and totals. Depending on the report chosen, the report headers will vary but will include subsequent data such as the following example for Scheduled Project Spend > Scheduled Profit.